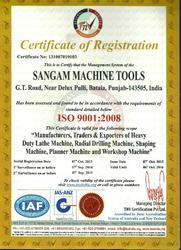 An ISO 9001: 2008 certified Sangam Machine Tools started its operations in the year 1994 and is considered to be one of the leading manufacturers, suppliers, exporters and traders of a wide range of optimum quality of Industrial Machines. Inclusive of Lathe Machinery, Radial Drilling Machines and Shaping Machines, we offer a wide range of product. The offered range of industrial machines is known among our patrons for its rich attributes such as less power consumption, reduced noise level, low vibration, low maintenance, high performance and longer serving life. Offered by us at industry leading prices, these industrial machines are highly appreciated among our patrons. The offered machines are used in sugar mills, steel rolling mills, paper mills and fabrication shop. Also, we export our product All over the world. With the aid of our state-of-the-art infrastructure, we have been able to cater to the precise needs of our valuable patrons in the most efficient manner. By using advanced machinery and equipment, we manufacture the offered range of industrial machinery as per the industry set norms and guidelines. As per the specifications, requirements and demands provided by the patrons, these machines can be customized. Before dispatch, the offered range is packed with standardized packaging to avoid any damage while transportation. Under the able supervision of our mentor, Mr. Karan Aggarwal, we have been able to attain a commendable position in this domain. He has helped us in attaining the trust and confidence of our patrons, owing to his customer centric approach. At Sangam Machine Tools, we have been backed and supported by a team of skilled professionals, who hold expertise in their area of operation. By working close coordination with each other, we have been able to avoid any kinds of hassles in the workplace. Boasting of a hassle-free working environment, we work to attain maximum customer approval and satisfaction. Their eye for details and utmost dedication has helped us in catering to the precise needs of our valuable patrons in the most efficient manner. At Sangam Machine Tools, we believe in making a long term and mutually beneficial association with our patrons by offering them high quality products at cost effective prices. Ability to manage bulk demands, customer centric approach, ethical business polices and transparent transaction practices, has helped us in attaining a commendable position in this domain. We accept different modes of payment such as cash, online, demand draft and credit card, keeping the ease of our valuable patrons in mind. Our state-of-the-art infrastructure has helped us in catering to the precise needs of our valuable patrons in the most efficient manner. Established in the year 1994, we have carefully divided our infrastructure into several units to ensure that all the on-going processes are carried out in the most efficient and streamlined manner. Our infrastructure is well-equipped with ultra-modern machinery required for carrying out large scale production. With the aid our large production capacity, we have been able to manage bulk demands in the most efficient manner. Being an ISO 9001:2008 certified name, we assure that the premium quality of the offered industrial machines is maintained as per the industry set norms and regulations. By conducting quality testing procedures, we assure that the best possible quality industrial machines are offered to our valuable patrons. Performance, sturdiness, durability, maintenance and serving life are some of the parameters on that the quality of the offered range of machiens is checked at our end. In addition to this, the offered industrial machines are packed with standardized packaging to avoid any damage while transportation at the patrons’ end.